The video above comes from a 2010 Allstate commercial that features Guillermo Ochoa, then the goalkeeper for the Mexican National Soccer Team. This is my favorite representation of what the proactive thought cycle looks like. We see the Ochoa's different moves in response to certain possibilities and we see the positive feelings as he saves each one, enforcing the feeling that he can do it. Then we see the actual challenge where he "does" make the move to save the penalty kick. Read on to learn more about how we can build this skill. Our default setting as humans is to go along with life until something happens that demands that we take action. But is this the way to achieve your potential? How would life unfold if we moved through it more deliberately? How could we create that for ourselves? It begins with understanding what it means to be reactive and what it means to be proactive. Reactive is defined as "acting in response to a situation rather than creating or controlling it". In sport, we can argue that we can neither create nor control the situations we are in. This is a major reason why sport is so attractive to us, because we are continually confronted with new problems to solve rather than following a script to a known conclusion. We are constantly challenged to adapt in response to changing conditions, strategies, and opponents. Those who can do it the best are the winners. I previously defined proactive as "creating situations that move towards goals and anticipate future needs and changes". So if sport is about constantly responding to dynamic situations, then how can we create our own situations? The answer lies in where we create the situations. We hear it said that it isn't what happens to us, but how we respond to what happens that matters most. This gets at the primacy of our internal environments over our external ones. Being proactive means creating an internal environment that will best prepare us for the ever-changing external environments that exist in sport. There are three phases in our thought cycles: thinking, feeling, and doing. These three phases are consistent between proactive and reactive cycles and what separates the two is the order in which the phases occur. These three phases correspond to the three stages of processing: mental, emotional, and skill/craft, discussed in my post "Failing Faster". Reactive thought cycles run through those stages in reverse order. First, we "do", we go out and execute a skill. Then we "feel", we have an emotional response to the skill we just performed. Last, we "think", we have a mental response in which we analyze our action and our emotion. This thought cycle tends to reinforce a fixed mindset because we see ourselves in light of our outcomes rather than our processes. 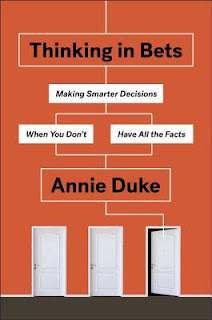 What we went through to arrive at that outcome is discounted, even if the outcome was out of our control (like a bad call from an official) and we wrap ourselves up in the results. We are no longer in control of our internal environment because we allow it to be determined by our outcomes. We allow ourselves to become victims of our circumstances when we don't have to be. When we run our thought cycles in a different direction, we put ourselves in control of our internal environments. We are proactive when we start our thought cycle with "think". Before executing a skill, we think our way through it by seeing ourselves executing the skill. If there is a specific part of the skill that we think is important then we can focus on that as we see the entire action unfold in our minds. In"feeling" we can use two different senses of the word. We can prompt positive feelings (emotions) like, "I can do this". We can also incorporate a modeling of the skill we want to execute (physical), reminding our bodies of what is to come. (Remember that the origin of "incorporate" is the Latin word meaning "form into a body".) Having prepared ourselves for what is to come, we then execute. As best as we can, we "do". During and after skill execution, we can apply our mindfulness training to be present and observe our execution. This gives us a bridge back to the beginning of the cycle because we take our observations and turn them into comparative and evaluative (as opposed to judgemental) thoughts that then inform our next execution ("bring my foot more forward next time"). We are in control of the process in every phase and we keep ourselves in a place where we are free to perform because we are free from out-of-control judgement and emotion. As with mindfulness, creating this thought cycle takes work, often guided practice. Thinking proactively is a skill so we should understand that we can improve it but that improvement takes time and attention. We should plan to incorporate work on this thought cycle as part of other skill training. So as the athletes are practicing a physical skill, we as coaches are giving feedback about the mental skill rather than the physical one. We empower our athletes as they become proficient at managing their thoughts and, by extension, themselves. We help them see themselves as vital actors instead of helpless victims in the unfolding of the dynamic situations that they find themselves in. The above image is from a practice in which I introduced a team to proactive thinking cycles. 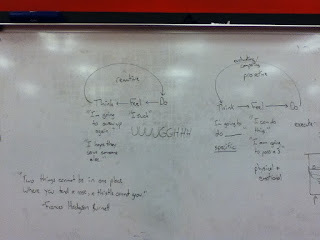 The "feel" and "think" examples were supplied by the athletes when I prompted them during our discussion. Thanks to Tim Engels for introducing me to this concept. Another good topic with things to consider and incorporate. My only wish is that the picture was bigger, so I could read it. I tried copying it so I could enlarge it, but it was too fuzzy.